The largest two-day loss in nearly three months sealed the S&P 500 with a second weekly decline and capped the index with its weakest April performance since 2012, up just 0.39%. Stocks broadly declined Friday, hurt by continued US dollar weakness and mixed earnings reports. The US dollar fell to the lowest level in nearly a year as weak consumer spending and the slowest first quarter GDP growth pace in two years showed signs the world's largest economy is struggling to gain traction. For the week, the S&P 500 fell -1.24%; the Dow Industrials lost -1.28%; and MSCI EAFE (developed international) slumped -0.44%. Real GDP increased at a meager 0.5% annualized pace in first quarter this year, and according to JPMorgan, new economic data recently received pose downside risks to an outlook for 2.0% growth in the second quarter. Weak 1Q growth has been followed by a 2Q bounce for the past two years, and we think that a similar pattern will play out again this year. However, this forecast depends heavily on a sharp improvement in the April growth indicators to be released over the next few weeks. 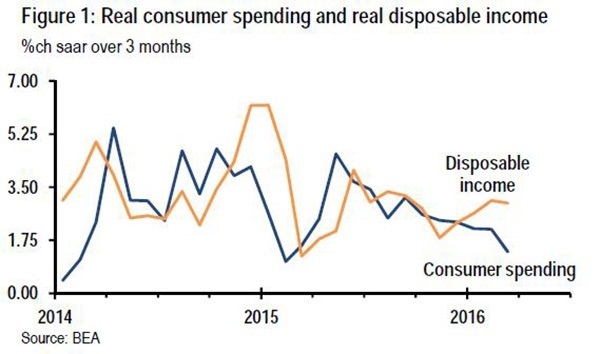 As this chart illustrates, the major downside surprise in the data lately is the slowdown in real consumer spending against the background of solid income growth. Thus, market analysts will be keenly interested in whether April retail sales due out May 13th include a bounce in core retail sales, alongside an expected bounce in auto sales. The April FOMC statement toned down the concerns expressed in the prior statement about global and financial developments, but also signaled no rush to get on with the second rate hike. Economists' current consensus forecast looks for rate hikes at the July and December meetings. But to get a hike by July, we will need to see evidence that growth is accelerating decisively by June.